continue reading "The age old question: Do pies taste as good in Wales?" Here is one to ponder. What if you made a pie with non standard ingredients, is it still a pie? For example, my fellow pierateers and I have often wondered about making a 'Piezza' which would basically be a pie where the top is actually a pizza. We would be clearly ditching the traditional pastry but it still has an encased filling, should be tasty and would fulfil the ratio of filling to case which sets apart a pie from other pastry based products such as a pasty. 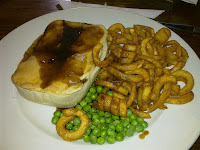 Also in urban pie I have definitely seen a 'cottage pie' which had mash potato instead of a classic pastry lid. My initial instinct is no, these seem to be closely related to pie and although special I feel they would be missing that 'Factor X' where the definition of Factor X is that it is impossible to define. It is mysterious and vague in a kind of real and tangible way. These are certainly closely related beasts but distinct rather like a horse and a zebra. While horses might not be an uncommon sight to many of us, we still go to the zoo to see zebra. Unless you live in Africa and in which case please tell me what zebra pie tastes like. Anyway, have a look at this. continue reading "Is it what's on the outside that counts?" 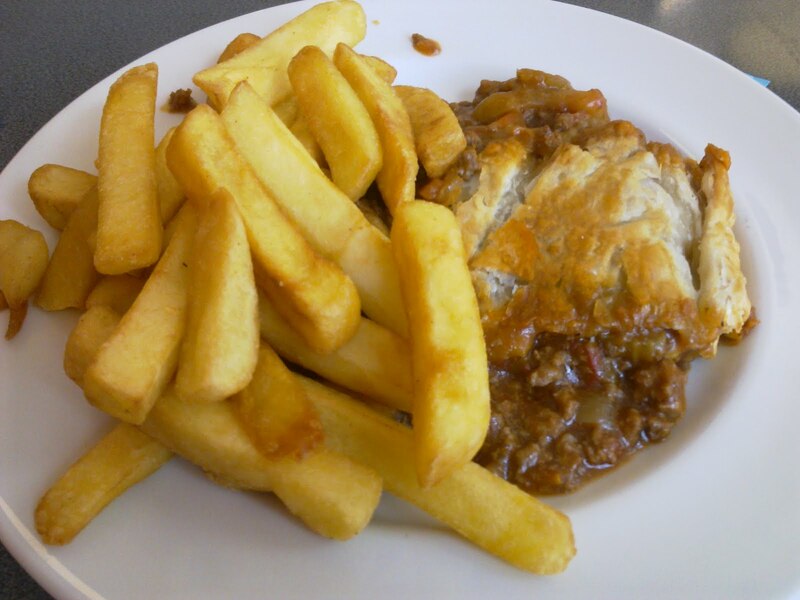 So I was happening to be in the main Aston University cafe – CafeTierra to you and me – and stumbled across “Beef and Onion pie” on the menu, reasonably priced at £3.20 as offering chips and veg as part of the meal. The outer crust looked so golden and appealing that I thought “hey, why not? !” and gave it a go, even though I’m certainly no Onion-lover (and therefore, sad to say, that does tend to put me off this flavour pie). When you imagine a beef and onion pie, you often think of either chunks of tender beef or, if a cheaper alternative, minced beef, in a rich beef gravy and with varying levels of onion but not a lot else in your pie. But that’s where you’d be wrong with the Aston Experience! For what you found having dug under the golden crisp coating was actually what can be best described as a minced beef tomato bolognaise inside a pie! What a shock! The tomato based sauce, with carrots and onion and a few other pieces of vegetable unknown to the untrained vegetable eater, certainly weren’t what the doctor ordered, but this pierateer was certainly highly impressed by the taste and how well it all went with the lovely golden pastry (by the way, did I mention the top of the pie was golden?) In fact, so much so that I will be trying to frequent this eating establishment again to see if there are any other pies on offer soon! And defo worth a try if you’re a D-I-Y pie maker – make a spagbol and then whack it in fine, crispy pastry and have it as a pie! 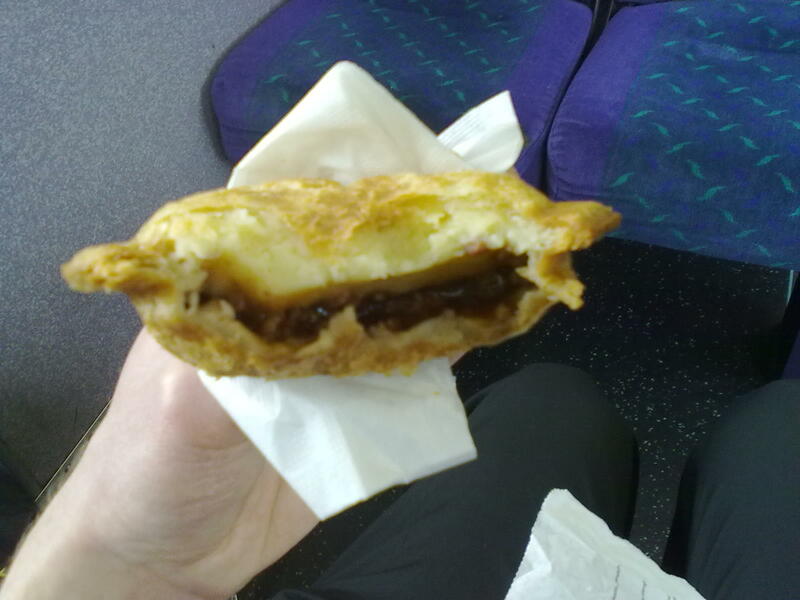 continue reading "Can I be bol-led over by the uni pie experience?" 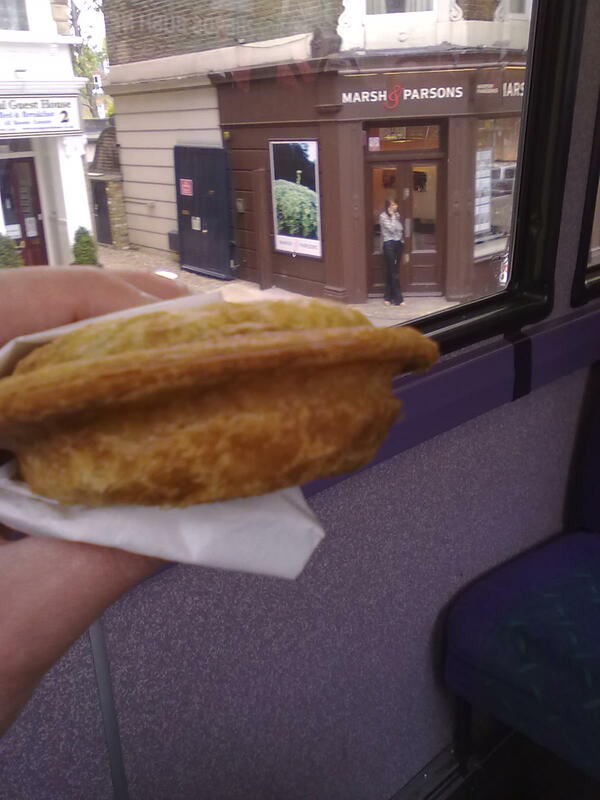 Of course, any pierateer would immediately jump off the bus to sample the potential delights contained inside. 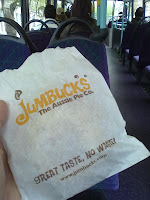 I believe it to be the only Jumbuck's Aussie Pie Co shop in the UK, although Jumbuck's pies are available in outlets such as pubs and universities through the UK. 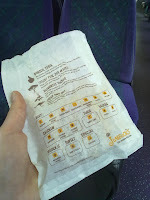 As you can see, the packaging of this innovative takeaway pie is quite banterful, promising "great taste, no waste". Sounds good so far! Why would anyone want to waste a pie? 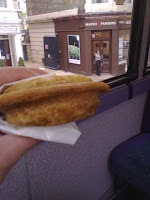 I decide to trial the takeaway nature of the pie by waiting for another bus and then eating it while on the go - a key feature of the Jumbuck's appeal. And there it is: a "bushranger deluxe", promising minced beef, mashed potato, bacon and cheese. 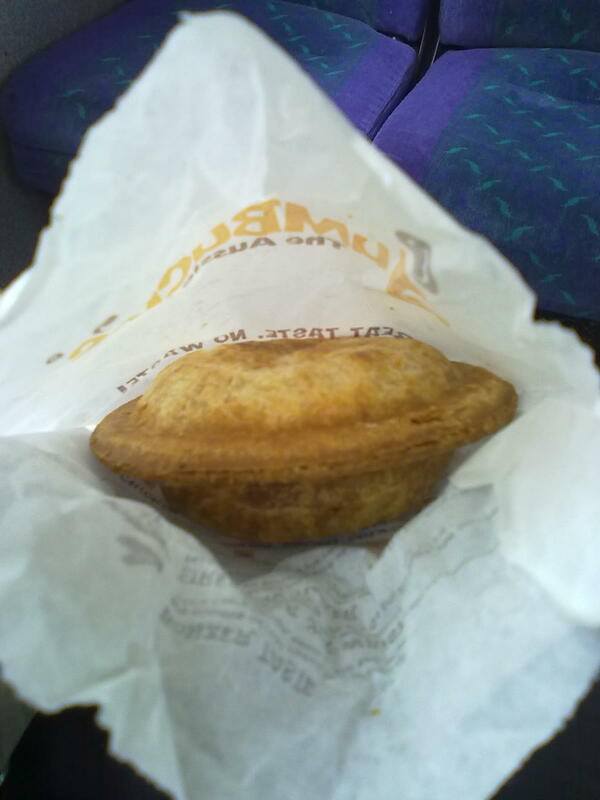 Costwise, Jumbuck's aren't cheap but then again, for a hot takeaway pie that carries a certain novelty, £2.20 isn't bad. 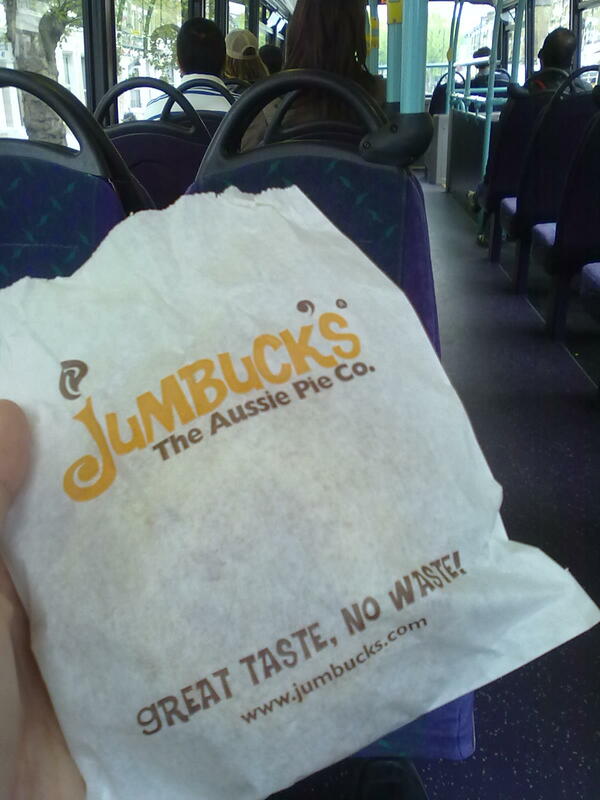 And this is what Jumbuck's pies were made for: cruising down Shepherds Bush Road on the top deck. A real pie on the go - no cutlery needed, just hands! Though until I've quite mastered how to eat one without spillage, I think I'll keep a napkin wrapped round it. The content of the pie is not dissimilar to a cottage (or shepherds?) pie encased in pastry. It does really work for me, though. I'm a real fan of pie and mashed potato, so this is really a convenient way of eating a pie with mashed potato on the move. It's genius, why have I not had this before? The capacity of the pie, however, is reduced somewhat by the mashed potato taking up the majority of the room. I would have prefered less mashed potato to make way for more minced beef. A nice surprise as I hit the bacon. It's all fantastic, I am really enjoying this pie. I personally felt that this pie was too small. Or perhaps I was just too hungry to not be satisfied in terms of hunger? But in terms of taste, this Jumbuck's bushranger deluxe is a winner in epic proportions. It may sound like an obvious statement to make, but pies really are loved all over the world! 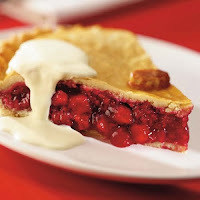 Take for example the complete opposite side of the globe, where a couple of New Zealanders want to show their love and appreciation for bubblegum pie (and what a great shout for a pie flavour that is!) 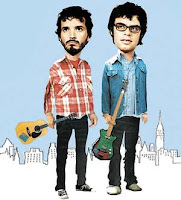 What better way to do it than by mentioning it in a music gig they were playing for several thousand followers of the band 'Flight of the Conchords'! If only they had also sang "Leggy Blonde" which also has the great lyrics: "I love pie!" continue reading "Pies - loved around the world!" 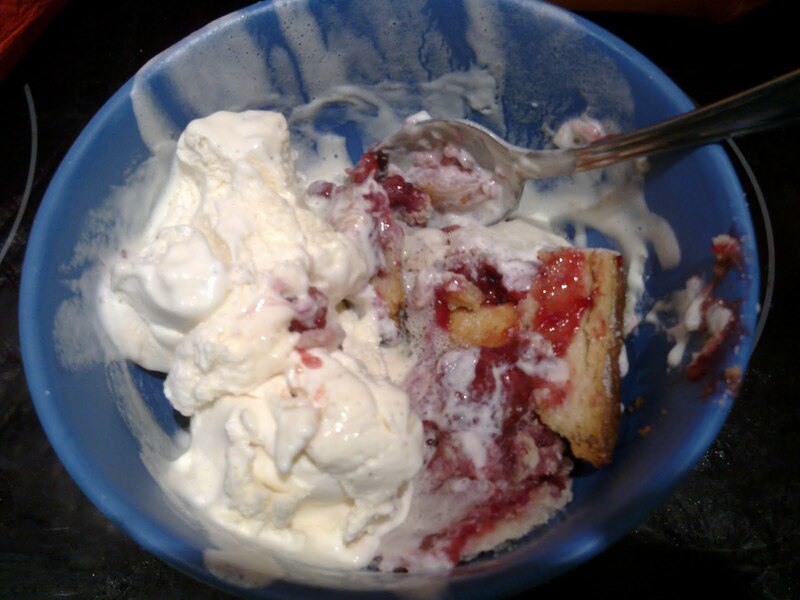 continue reading "Best pie in the house?!" Saino’s – their values apparently make them different...but do their pies? Being an own-brand, it is significantly cheaper than some of the alternatives, while still being of a good quality due to the Saino’s values which cover many a webpage and shopping aisle. One certainly hopes these values have helped make the pie as good as can be, and I would agree it is well worth a purchase. While the pie’s condition after heating was rather crumbly, this certainly didn’t detract from the great taste and satisfaction of eating a pie with friends. The only drawback is that we didn’t have one each, but had to share! continue reading "Saino’s – their values apparently make them different...but do their pies?" Being the professionals we are a couple of pierate delegates were dispatched to the recent Chilterns Festival of Food to see what pies were available among the culinary treats. Considering the variety of food available pies were well represented and a couple of them soon caught the eyes of our ravenous reviewers. 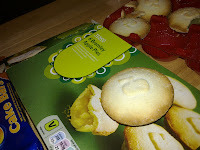 Each pie was a large 'family' size and cost a bit under a fiver so not the cheapest4. This one really looked fantastic, a lovely golden colour6 pastry with a nice handmade condition6 to it. Both the steak and ale are produced on the farm in Oxfordshire giving it a low food miles count but we all know the proof of the pie is in the eating. Unfortunately this is where it fell down. The height of the pie was low in relation to it's width meaning it missed out on the ideal pastry to filling ratio and had a disappointing capacity4. This wasn't helped by the overly eggy taste of the pastry which was slightly chewy4. Delving into the content2 the actual ingredients were of high quality and it was good to see some vegetables, often the forgotten food group in pies. 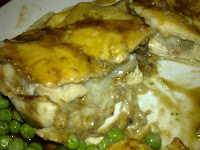 However the consistency1 wasn't ideal primarily due to a lack of gravy. This resulted in it being a bit of a chore to eat and having a fairly bland taste. To this reviewer it seems that a lack of pie expertise is holding back The Complete Pig in their pie making. Being a small company based on one farm I get the feeling these pies are a bit of an experiment or side venture. In fact if you look at the website there is a picture of a guy holding a bottle of ale who looks remarkably like the the man we purchased the pie from. I wouldn't be surprised if he makes the pies himself as well. I've no doubt that these pies will improve with experience and I'd love to try one again at a later date. Have a look out for them at a farmers' market near you and keep us updated. Looking at the Lime Tree's website it seems that while they make other products pies are their number one priority. There are some videos on there to really make your mouth water. This family business from Nottinghamshire seem to have hit the big time, producing 15,000 pies a week. You can even buy the pies online or the ideal world shopping channel! Just from the photo, its clear the pie is bursting with content7. They couldn't cram much more into their pies. However the capacity5 could be a little bigger. Lime Tree only use short crust pastry but they are clearly experts with it. It is sweet, light and soft; ideal with this pie. 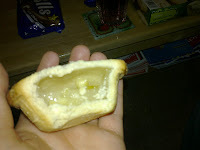 The consistency7 was near perfect, the filling was moist and had a sour tang but only enough to make it flavoursome. There was hardly any chewiness7 so the pie almost melted in the mouth. Presentation wise it was in good condition7 although there was a lack that quintessential golden pie pastry colour5. Overall this pie was fantastic, I can't wait to try some more! continue reading "Chilterns Festival of Food 2010"
Today's review is of a "Tesco Beef and Onion Pie". It is important to review these supermarket own-brand items, because you may be pleasantly surprised by their quality and relatively low prices. This review is of the normal Tesco pie, as opposed to the Tesco Value Beef and Onion pie which may have to be saved for another day. I'm sure you'll agree, this pie looks fantastic with a golden brown colour. The pastry looks wonderfully crispy and not too stodgy. A close-up of the content. Looks great! Filled with tender beef and generous amounts of gravy. The filling:pastry ratio is excellent. I go in for a taste - the filling is succulent and melts on the tongue. I particularly like the pastry too, it does not taste fatty and stodgy but rather light and crunchy. Tesco really have done themselves proud with this beef and onion pie. Just look how great it looks on a plate with some chips! (Please note, this plate does not belong to me and so am not responsible for the spottiness of it!). Would purchase again, if only there weren't so many more pies to try. continue reading "Every little pie helps"